After using a 360 degree rotating cover case for the iPad mini for the last couple of weeks the swivel broke, my fault as I twisted it and pulled at the same time, huh! So I bought a standard case that came with a screen protector. It comes in two parts that’s extremely easy to put together. 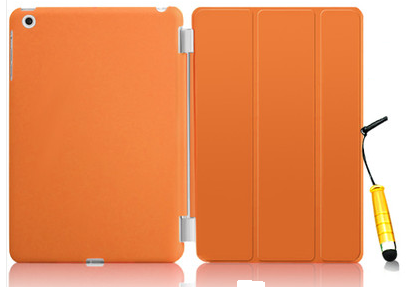 Ultra slim design and stylish, Polyurethane smart cover. It has a Build-in Magnetic, makes it stay attached with iPad’s magnets built frame. This allows the automatic wake/sleep when you open or close the smart cover. Soft microfiber interior lining that protect your screen and keeps your display clean. Cut outs allow access to all buttons of the iPad Mini, and all all in line. the back of the case is a hard back case for iPad mini which wraps around the corners protecting the iPad. 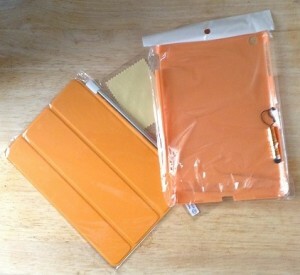 It protects the iPad against dust, scratches and bumps. One other point is that has it’s magnetic it should stay shut if you drop it protecting the screen.